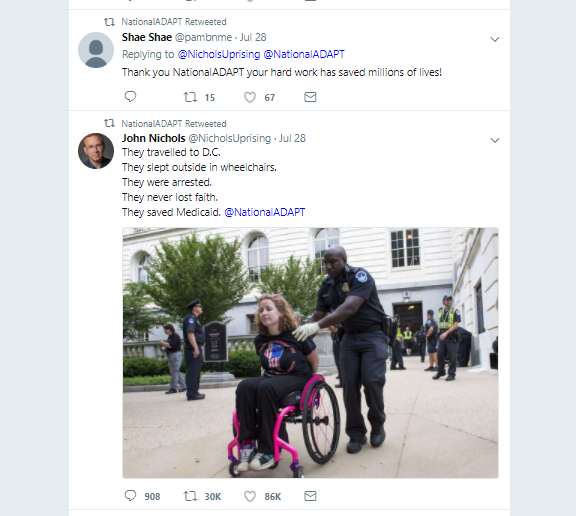 A Screenshot of the National Adapt Twitter Feed shows a woman in a pink wheelchair being arrested. Okay, I know it’s August. I’m a little late. But I did not forget! July’s donation goes to ADAPT. ADAPT is the leader in the effort to prevent the repeal of the ACA. They were on the ground, protesting everywhere. They were loud. They made it to the news. They were featured on Rachel Maddow. And all the while, they kept us informed on Twitter and Facebook. I couldn’t make it to a protest, but I felt in on the action. ADAPT showed that winning on social media leads to winning in the halls of Congress. Please consider donating to the ADAPT. And if you want to see them in action, follow them on Twitter and Facebook.